People familiar with Google’s Streetview, which is basically panoramic virtual tours on maps, would be forgiven for thinking Panedia is just another ‘me too’ effort. Allow me to show you how this is not the case. 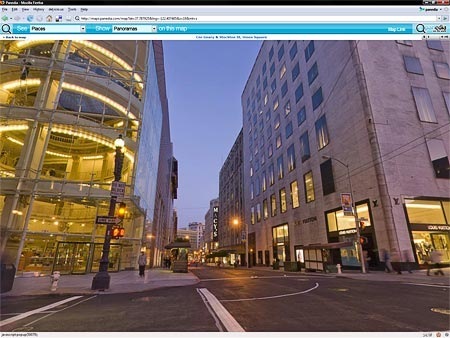 There are fundamental differences between Streetview & Panedia, which produce vastly different end results. One isn’t better than the other, they are both great technologies, but they both serve very different purposes and potentially different markets. Use Panoramic Virtual Tours to produce the worlds best destination content and create a visual archive of our changing world. Make the content available in as many mediums as possible. Result: Use professional photographers & equipment along with extensive automated workflows to produce some of the most beautiful destination content available. Shooting places of interest & of historical value. Use the content in may ways including adding it to maps for online viewing. As you would expect these philosophies lead to very different results where Street View & Panedia overlap, ie on maps. Panedia = Low quantity of extremely high quality panoramic virtual tours on maps. Google Street View = Vast quantity of low quality panoramic virtual tours on maps. 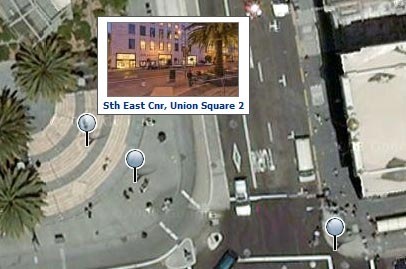 Google Streetview – Cnr Geary & Stockton St – Union Square, San Francisco. Panedia = Low quantity of extremely high quality virtual tours on maps. Panedia – Cnr Geary & Stockton St – Union Square, San Francisco. So what markets are most suitable for each technology? Streetview offers 10’s of thousands of low quality panoramas of a given city/area making it ideal for looking up a particular address to see what it’s like at that spot. The recent mashup of Streetview content on Trulia, a major US realestate site, is an outstanding use of Steetview in this context. Travelers though, need to know something about a city before going to Streetview as no one has time to look through 10,000+ panoramas. Of course you can search for particular places in Google maps and look at them in Streetview, but you still need to know interesting places to search in that city before starting. There is far too much choice to just start clicking randomly on Streetview panoramas. Panedia on the other hand will offer 100’s to 1000’s of very high quality panoramas of a given city/area. These panoramas will mainly be shot in areas of interest for travelers. Therefore the viewer doesn’t need to know anything about a city before discovering amazing places to experience. On Panedia those places have already been selected and shot by professional photographers. The viewer doesn’t need to open a panorama to find interesting places to see, as each one has a thumbnail image of the best view from that spot….this thumbnail is instantly available on the map, and permanently visible in the thumbnail sidebar. Panedia content is not shot from a car, so it can be produced anywhere, allowing travelers to experience places a long way from the road. From beaches and National Parks, to trails, mountains, waterfalls, accommodation, tours, shows & a lot more. As mentioned already Streetview content is being put to great use by Trulia with a lot more to come no doubt. Panedia content can be used online & offline. The resolution & quality of the master panoramic files is such that they can be used for poster prints, magazine reproduction & billboards. The can also be used in video up to HD and even cinema resolution. Panedia content is also being used to produce desktop wallpapers at 2560×1600 up to triple monitors. 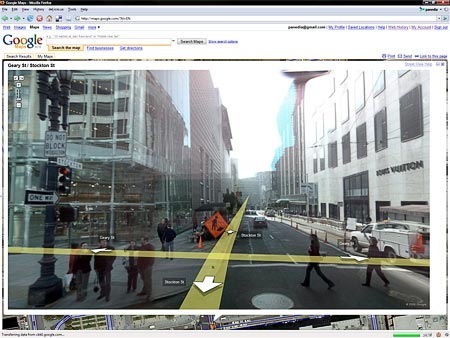 Both Google Streetview & Panedia are amazing examples of what can be accomplished with georeferenced panoramic virtual tours, while they represent the extreme opposites of the spectrum in quality vs quantity. In a nutshell, Streetview is an engineers system for getting maximum coverage while Panedia is a photographers system for achieving maximum quality. The best solution for users would be a combination of technologies, offering the huge coverage of Streetview and the amazing quality of Panedia’s everything but street view content. With the new Streetview API we plan to implement this solution when Google releases their Australian Streetview content, rumoured to be launching mid 2008.